Biology … is the least self-centered, the least narcissistic of the sciences—the one that, by taking us out of ourselves, leads us to re-establish the link with nature and to shake ourselves free from our spiritual isolation. In the sciences hypothesis always precedes law, which is to say, there is always a lot of tall guessing before a new fact is established. The guessers are often quite as important as the factfinders; in truth, it would not be difficult to argue that they are more important. From Baltimore Evening Sun (6 Apr 1931). Collected in A Mencken Chrestomathy (1949, 1956), 329. Its [science’s] aim is simply to establish the facts. It has no more interest in the moral significance of those facts than it has in the moral significance of a streptococcus. From American Mercury (Sep 1927). Collected in A Mencken Chrestomathy (1949, 1956), 331. Quoted by F. R. Moulton, in Introduction to Astronomy (1906), 199. Returning to the moon is an important step for our space program. Establishing an extended human presence on the moon could vastly reduce the costs of further space exploration, making possible ever more ambitious missions. Lifting heavy spacecraft and fuel out of the Earth’s gravity is expensive. Spacecraft assembled and provisioned on the moon could escape its far lower gravity using far less energy, and thus, far less cost. Also, the moon is home to abundant resources. Its soil contains raw materials that might be harvested and processed into rocket fuel or breathable air. We can use our time on the moon to develop and test new approaches and technologies and systems that will allow us to function in other, more challenging environments. The moon is a logical step toward further progress and achievement. 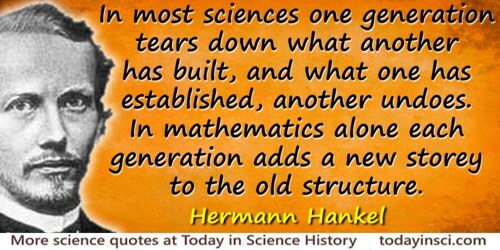 The entire mathematical arsenal that our modern sages command cannot establish facts. Practical people should always keep this in mind when they ask mathematicians for help. As translated from Literaturnaya Gazeta (5 Dec 1979), 49, 12, in 'Miscellanea', The American Mathematical Monthly (Aug-Sep 1980), 87, No. 7, 589. Whenever there is a great deal of energy in one region and very little in a neighboring region, energy tends to travel from the one region to the other, until equality is established. This whole process may be described as a tendency towards democracy. In 'Science and Religion', collected in Al Seckel (ed. ), >Bertrand Russell on God and Religion (1986), 175.